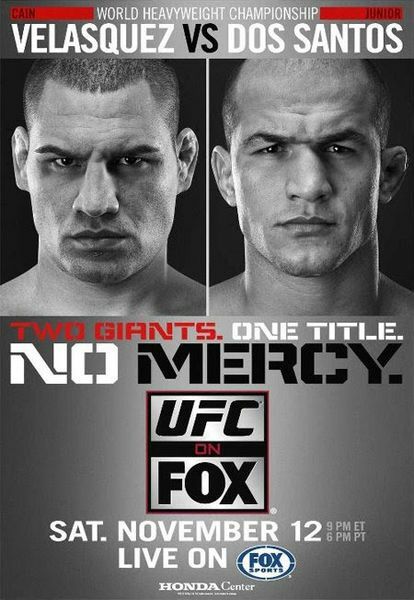 1) The UFC makes its debut on the Fox network this coming Saturday with a UFC Heavyweight Title Match between the champion Cain Velasquez and the number one contender Junior Dos Santos. Who do you have coming out on top? Unfortunately for me, both men enter this fight undefeated, so I can’t really make any sound predictions based on where the fighters have gone wrong in the past, considering neither has actually lost a fight. That is all going to change Saturday though. The big question going into this fight is whether or not Velasquez is fully healed from rotator cuff surgery for an injury he suffered during his fight against Brock Lesnar. Cain has been sidelined since that encounter, and one may wonder whether Velasquez will show any ring rust for being out so long. Dos Santos is coming off an impressive unanimous decision victory over fellow power-puncher Shane Carwin at UFC 131. Junior was able to use his impressive boxing skills to his advantage, landing a good selection of punches, as well as 2 takedowns in the 3rd round, proving that he can do more than just knock your block off. 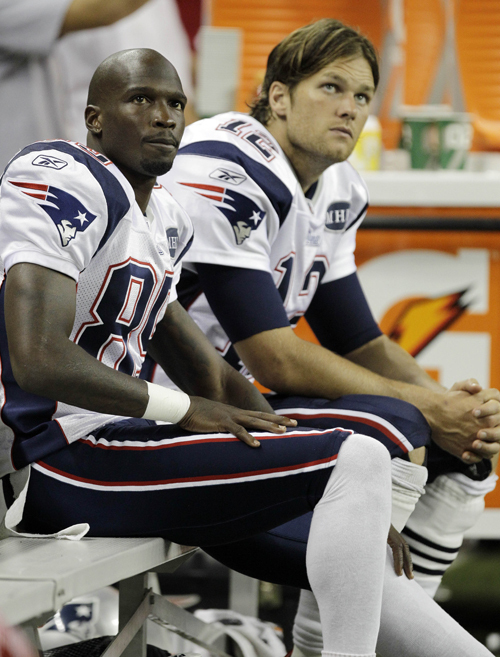 2) Has the Chad Ochocinco experiment in New England been a failure? It has been nothing but a failure to this point. Through 9 games, Chad has only 9 receptions, 136 yards and a grand total of 0 touchdowns. Of a possible 583 Patriots snaps, he has only played in 181 of them. Of those 181 snaps, he has only been targeted 21 times. Of those 21 targets, he has only caught the ball 9 times. Pretty bad numbers for a guy who was supposed to be the Patriots new deep threat to replace a Randy Moss. I believe the only reason New England is keeping him on board is because he can keep the defenses honest. A majority of Tom Bradys throws have gone to and connected with Wes Welker and Tight Ends Rob Gronkowski and Aaron Hernandez. Chad Ochocinco is more than capable to make big plays on his own, and with other big targets on the field drawing attention, that gives Chad more of a chance to make those kinds of catches. Unfortunately, he hasn’t done that yet. Whether or not Chad’s time in New England is coming to an end (like fellow free-agent signing Albert Haynesworth) is still a question at this point, but if he can’t find a way to make some sort of impact on this offense, then he may be kissing his time in a Patriots uniform good-bye. 3) Should the Pittsburgh Penguins rush Sidney Crosby back from injury? Sidney Crosby suffered a concussion during last seasons “NHL Winter Classic” game, and to this point and time, he remains on injured reserve. There is no timetable for his return. Why should there be a rush to get this guy back on the ice? I realize he is the face of the Pittsburgh Penguins, the poster-boy for the NHL and perhaps the best hockey player in the world. Crosby playing hockey equals more butts in the seats, which equals more money in the pockets of a lot of people. But Sidney Crosby is a long-term investment for the Penguins and the NHL. A concussion is no laughing matter, and should be treated with the utmost of care so that when Crosby does return, he is 100%, which lowers the chances of him having a relapse of concussion-like symptoms. Hockey is a violent sport, and heavy hits happen all the time. Whose to say that Crosby won’t be hit again and knocked out of action? All that matters now though is making sure Crosby is healthy to compete. Besides, it’s not like the Penguins are struggling without him. They sit at the top of the Eastern Conference with a 9-3-3 record. Sure, when Crosby returns, that will just add one more elite scorer to an already stacked roster. But if the Penguins are succeeding without him, then why rush him back at this point? Make sure “The Kid” is good to go, and then when the time is right, send him out there, and let him and the Pittsburgh Penguins do what they do best. Score goals, entertain the fans and win a lot of games. 4) Do you agree with the push that WWE Raw Superstar Mason Ryan is currently getting? I don’t agree with the push, but I understand where it is coming from. Vince McMahon and the WWE have always had a love for the big, muscular guy. They tend to have a good look to them and are able to get over with the crowd as dominant, powerful in-ring forces. Mason Ryan has that similar look and build, and that is why he is getting pushed the way he is. He is a little to green in the ring at this point. His fundamentals in the ring aren’t where they need to be. He can be a liability at times considering his size and lack of experience. Also, he is just terrible on the microphone. There is a reason he doesn’t do a lot of talking, but if he wants to evolve his character, he is going to have to learn to add some personality or overall mic skills to his repertoire. I believe the reason so many fans (at least the internet wrestling fans) are so hard on Ryan is because they believe his push should be going to others on the roster. What ever happened to Alex Riley? John Morrison? Drew McIntyre? All these guys had their pushes dropped for no apparent reason, and now all of that energy put into them seems to be going into Ryan. I wish Mason Ryan well, as I will give anyone a chance to develop and prove me wrong. Who knows, maybe he could one day be as big as Dave Batis….